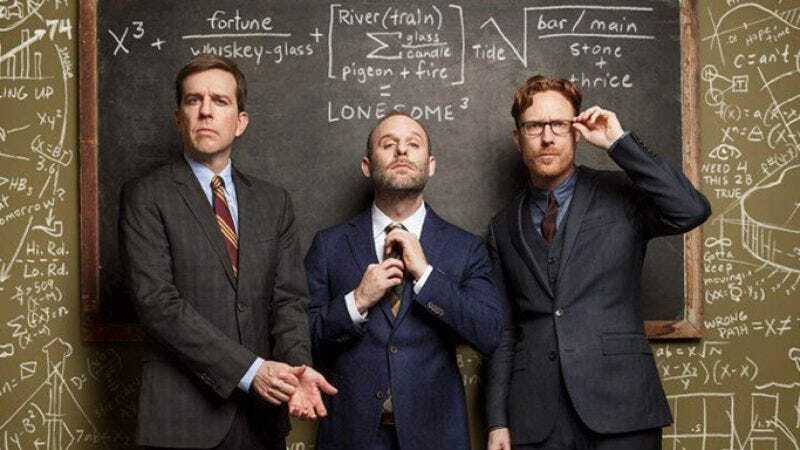 Ed Helms had a tendency to break into song all the time in the later seasons of The Office, but we’ve still been curious to hear what he would sound like on the first album from his band, The Lonesome Trio, ever since we first heard about it at the end of April. He promised a “unique” blend of “acoustic folk, bluegrass, and lovelorn country with warm-hearted, often slyly funny lyrics,” but could anything live up to that lofty description? Well, now you can find out for yourself, because Entertainment Weekly has a stream of The Lonesome Trio’s entire self-titled debut. As you’ll hear, the album certainly has a unique blend of acoustic folk, bluegrass, and lovelorn country, but whether or not its lyrics are slyly funny and warm-hearted remains to be seen. Also, Helms affects a folksy twang when he sings, and there are a lot of references to whiskey. One song is even called “Whiskey Drink,” which we’re pretty sure is a “Tubthumping” reference. You can preview one of the songs below, but, again, you’ll have to go to Entertainment Weekly to hear the rest. If you’d rather buy the album, it’ll be in folksy record stores—and on iTunes or whatever—on June 16.